… In 1940 a good friend of Juan D’Arienzo, Hector Varela formed his first orquesta. But just about at the same time, D’Arienzo lost all of his orquesta to his former piano player, Juan Polito. And so, D’Arienzo, managed to persuade Varela to play the first bandoneon, in the orquesta that Varela just formed… but under D’Arienzo name and direction. To the negotiation table D’Arienzo brought the finest violin of Cayetano Puglisi (see “The Magic Violin of Cayetano Puglisi“) and absolutely unknown at the time, 17 years old pianist Fulvio Salamanca. Varela agreed, and 10 years of success, including the whole epoch of Hector Maure, “El Huracan”, and the return of Alberto Echague followed. In 1950, Varela decided that it is finally time to create his own orquesta, and left the orquesta of his friend. D’Arienzo immediately appointed Salamanca as his new arranger, and the new epoch of “El Puntazo”, “Yapeyu” and other smashing hits of the 50s began… while Varela was working hard to gain popularity on his own. However, Argentino Ledesma was still reluctant about his tango career, and started working, in parallel, as a bookkeeper on the same radio. One day he sent an application for a bookkeeping job to some important-at-the-time establishment in Buenos Aires, of which the history does not even mention the name. He was invited indeed, but in Buenos Aires, again upon insistence of his friend, he came for audition on Radio Belgrano, was immediately awarded with a full year contract, and, after this year passed, was introduced by the executives to a modern and fashionable orquesta of Hector Varela. His debut with Hector Varela was in 1952. The place? The very same Cabaret Chantecler where, in the December of 1935 Juan D’Arienzo offered piano seat to Rodolfo Biagi, after his own piano player was late for the performance (see “Pensalo bien“). The settings? Varela already had a singer. But starting in the 40s, each orquesta worth of its name, would have two, not one singer. And so did Varela. Rodolfo Lesica was his first choice, and Argentino Ledesma – second. When Varela, looking for a new repertoire, found “Fumando espero”, he first offered it to Lesica. 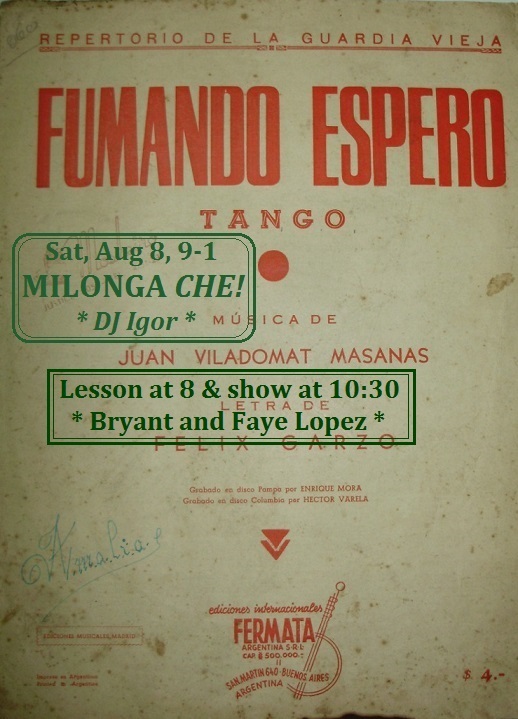 Lesica’s shrugged it out: “Let the kid sing it!” And so, in 1955, “Fumando espero” was “premiered” by Argentino Ledesma for the second time, and recorded as well, however, without much of success. Feeling his lips to kiss with knowing kisses. When I feel his eyes hungry with passion. My smoking is a pleasure. The ardent flame of love. Full Castellano lyrics with English translation by Paul Bottomer can be found on the liner notes of Orquesta Tipica Victor recording and other recordings from “Today Tango Is…” channel.